The years when children attend summer camp intersect with some of the most impressionable years of a person’s life, when social interactions, experiences and lessons often form long-term identities. Choosing the right camp can seem intimidating in that respect, but it doesn’t have to be. All camps offer benefits for children that include developing confidence, social skills and a sense of independence. But if it’s a priority that your child(ren) cultivate an appreciation for and tendency toward empathy, environmentalism and community service, there are some camps that make good deeds a part of their focus. Camps that incorporate good deeds help children grow into adults who are better equipped to be civic leaders, empathetic neighbors and environmental advocates. Arabella Spear and Sophie Craciun work in H2O’s plot in the Madison Lakewood Earth and Food (LEAF) community garden. The food they grow is donated to Lakewood Community Services Center. 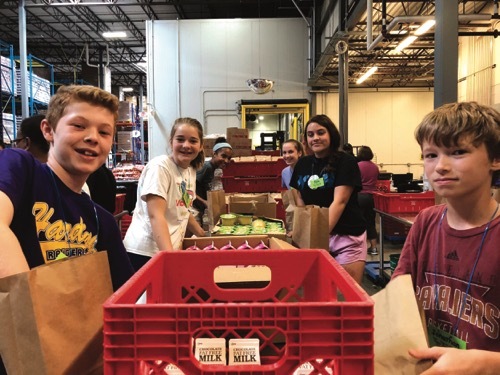 The Summer Service Camp’s program is completely centered on community outreach and philanthropy, with activities ranging from working the assembly line at the Greater Cleveland Food Bank to visiting elderly care facilities to working the land at a community garden. While this particular camp is only for Lakewood residents, parents living in other cities can check with their local civic organizations to see if there is a program available (or if not, if one can be started). Expanding outside of the hyperlocal community, Camp Whitewood, in Windsor, is a 4-H camp that incorporates all of the traditional outdoor camping activities like swimming, hiking, crafts and such, but the undercurrent of the entire camp is good stewardship of nature and the welfare of other human beings. Got an animal lover on your hands? Some camps offer service learning through education and care of animals, including local animal shelters that offer summer youth experiences or summer day camps at the Cleveland Metroparks Zoo or Akron Zoo. Sue Ford, lesson and camp manager for Chagrin Valley Farm’s summer programs, emphasizes the importance of instilling confidence, responsibility and empathy in campers. Similar to traditional outdoor camps, problem-solving and physical activity are part of daily life. But at CVF, it’s all in horse-related activities. Emily Potoczak is helping her group work on their rain barrel. If your family loves the idea of a traditional camp experience, but still wants a sampling of good deeds sprinkled in, there are many camps that weave in stewardship and community service as a component of the program. The Girl Scouts and Boy Scouts of America camps are well-known for their multi-component camps that incorporate traditional elements like campfire building, orienteering, hiking, boating and exploring nature, while teaching children the importance of good environmental stewardship and humanitarianism. Summer camps like Camp Roosevelt-Firebird in Bowerston work with their local community to add service projects into the camp experience. Things like jumping in on a Habitat for Humanity project, maintaining the grounds of a nearby cemetery or helping local farmers all help to cultivate a service-based identity in campers. If your family is looking for ways to grow your child’s exposure to empathy and giving back, camp can be a great way to do so. As your family is comparing camp options, look into each camp’s programming and ask the director questions related to how they incorporate service, good deeds and stewardship into their experience.